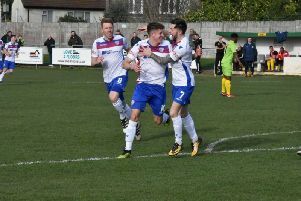 AFC Rushden & Diamonds claimed one of their best wins of the season as they edged out fellow play-off contenders King’s Lynn Town at Hayden Road. This was one of the best wins of Andy Peaks’ reign as manager of Diamonds - it might even be the best of the lot. This was an observation I made on Twitter immediately after the final whistle. This may not have been a cup final or a game that decided a title but it must surely be in the conversation when we assess the best wins Diamonds have picked up during Andy Peaks’ reign as manager. King’s Lynn are a club who racked up no fewer than 100 points at Step 3 last season while Diamonds were gaining promotion from the level below. If you believe what you hear (trust me, I don’t believe half of it), the Linnets have a bigger budget than most in the division and that is reflected in the undoubted quality they have in their ranks. The fact that Diamonds are competing with clubs like King’s Lynn is an achievement in itself when you consider how far they have come in such a short space of time. To beat them is just the latest evidence of how far the team has come on the pitch. Long may it continue. It might not be everyone’s cup of tea, but the second half showed just how important defensive discipline is. We’d all love to see free-flowing football and goals galore week in, week out. But the reality is that sometimes you have to produce grit and determination to get the job done and that’s what Diamonds did on this occasion. A lot of effort went in to get the game on after the heavy rain on Friday and it meant the Hayden Road pitch was heavily sanded and cut up quite badly once the action got underway. In fairness, both teams tried to play and the first half was an open affair with chances at both ends. Diamonds took their opportunity but the second half was all about the defensive side of the game. King’s Lynn dominated possession but Diamonds produced a disciplined display. They kept their shape, they allowed the visitors to play in front of them and when the time came, the back four were brave as they made headers and blocks to ensure goalkeeper Ben Heath didn’t have a save to make. It was the ultimate battle between defence and attack in that second half and Diamonds got the job done in impressive fashion. Alex Collard was at the heart of that defensive masterclass and is getting better and better by the week. The central defender arrived as something of an unknown when he joined Diamonds at the end of November. But his performances since then would suggest this has been yet another bit of good business by Andy Peaks. Collard was a real lynchpin at the heart of the defence while captain Liam Dolman was sidelined due to an injury but the pair are now forming a partnership, which well and truly blossomed on this occasion. They marshalled their troops well during a tough second half when King’s Lynn dominated possession. They stayed disciplined and headed and kicked everything that was thrown at them. But the undoubted highlight was when Collard capped an excellent display with a brilliant goal-saving block to deny Craig Parker. An impressive performance and there will be more to come. Tom Lorraine was at it again, he is having a season to savour. It’s not the first time I have written words of praise for the Diamonds striker this season and, given his fine form, it won’t be the last. There’s just something really likeable about Tom Lorraine. He has come through the leagues with the club, scoring goals aplenty along the way. Often written off by some when making the next step, he just seems to get better. Whether it’s an aerial battle or a footrace when running the channels, Lorraine gives it his all. He is the perfect example of a hard-working footballer and he has taken his form in front of goal to a new level this season. One of the criticisms of him in recent campaigns was his chance to goal ratio. But there have been no problems this time around. He has 20 goals to his name in all competitions and he had one clear chance in this game, he took it with great composure and it proved to be the winner. That put him on 90 goals for Diamonds. Don’t be surprised if he reaches the century before the season is over. If Diamonds are to get into the play-offs, they need to win some big matches. This was the perfect way to start.